This page gives information on some events organised or promoted by P&SC members. Sir John Osborn, a former Conservative Member of Parliament and long-standing member of the Parliamentary and Scientific Committee, died on 2nd December. A full Obituary appeared in the Daily Telegraph on 11th December – a link to the obituary is below. In the run-up to the general election, the Society of Biology held a parliamentary event to discuss the political stances of the UK’s main parties on issues affecting science. Seven-way political ding-dongs were all the rage this year. Somewhat surprisingly, the buildup to the 2015 election was dominated by the format of the TV leaders’ debates, with the growing influence of smaller parties causing headaches for both politicians and broadcasters. Not wanting to miss out, the Society of Biology held its first parliamentary hustings in March, inviting representatives from seven of the UK’s political parties to discuss their views on science ahead of the general election. 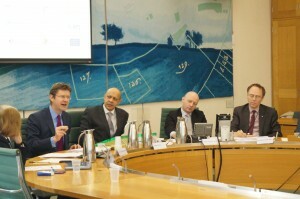 The British Ecological Society (BES) also held a six-way discussion on ‘people, politics and the planet’ in March. The good news is there is plenty of consensus among political parties when it comes to science. All of them acknowledge both the intrinsic value of science to society and its value to the UK economy. However, the supply of resources and skilled scientists to the sector often depends on wider political issues, such as immigration, education and fiscal policy – and it’s here where the parties differ. Plaid’s Hywel Williams said that their post-election priority would be to secure more funding for Wales – at least as much as Scotland gets. He said it must be recognised that innovation can happen anywhere, including rural north west Wales, and not just in England’s top higher education institutes. Wales has a great history of scientific innovation, but needs more money, he added. Williams said he and his six brothers and sisters were all given the chance to complete higher education, despite their poor background, and that the current way of funding higher education would prevent similarly large families from sending their children to university. He recognised the need to secure long term funding for Welsh universities, which currently charge a maximum of £3,000 in tuition fees rather than the £9,000 in England. Greg Clark had only been the Government’s science minister for a few months when he published a 10 year Science and Innovation Strategy. His predecessor, David Willetts, was admired by many in the science community for having a good understanding of the issues affecting scientists in the UK. The 2010-15 coalition protected the science budget and the Conservatives promised to increase capital spending in line with inflation over the following five years, if elected. In an exclusive interview with The Biologist in February, Clark said his enthusiasm for science as a key investment for the UK was shared throughout Government right up to Chancellor George Osborne and Prime Minister David Cameron. At the Society of Biology’s hustings event, he countered opposition promises on spending by saying that the amount of money available for science was dependent on how the economy overall is performing. In the face of criticism of the Government’s immigration policies, Clark pointed to UCAS figures that suggest the number of foreign students applying to study in the UK is actually due to rise by 4% this year. On tuition fees, he said there had been a 10% jump in students going to university from underprivileged backgrounds, thanks to access grants paid for by the increased fees. “Liam’s idea requires universities to go cap in hand to the treasury asking for billions of pounds each year,” he said. At the BES political hustings in London, Conservative peer Lord de Mauley said the Government still had “much to do” on the environment. But he said the coalition had achieved three-quarters of the aims set out in its environment white paper. Shadow science minister Liam Byrne said that if elected, Labour would ring-fence science funding for the next 10 years, and that his post-election priority would be to ensure England’s higher education system was sustainable. In February Labour announced plans to reduce tuition fees from £9,000 to £6,000. The £3bn shortfall would be funded by increasing tax revenues from high earners’ pensions. “The university funding system is going to go bust because three-quarters of students can’t afford to pay back their loans,” Byrne told delegates. Byrne has repeatedly said that Germany’s aim to spend 3% of its GDP on research and development is a “good ambition” for the UK, but it was not an official Labour party policy. He also said he hoped greater access to cloud computing could lead to “collaboration between scientists like never before”. At the BES debate, the shadow minister for the natural environment, Barry Gardiner, said the Government should recognise the ties between the environment, health and economics, and said Labour would introduce stricter regulations on fracking. The Green Party was unable to field a representative for the Society’s pre-election debate on science, not helping the party’s poor history of engaging with scientists on issues such as the genetic modification of crops. On more traditional environmental issues, however, the party is much more comfortable. Party leader Natalie Bennett appeared at the BES’s debate on environmental policy to say her priorities were a move to green power as soon as possible, the establishment of a network of marine reserves, a reduction of waste and greater steps to protect UK soils. “We advocate a return of power to local communities with a message from the centre to protect ecologies,” she said. UKIP MEP and former biochemist Dr Julia Reid announced that her party would waive tuition fees for students studying science, technology, engineering, medicine and maths subjects. The party’s proposed points based immigration system would not stop students and scientists coming to the UK, she said, before suggesting that reducing the number of migrants from the EU would mean the Government could accept more people from the rest of the world. Despite claiming UKIP were pro-science, Reid did the party no favours by declaring at the start of the Society’s debate that she is a climate change “realist” not sceptic who “challenges the current orthodoxy on climate change”. At the BES debate, UKIP spokesman William Cash also said the party was “the pro-countryside party”. But his environmental proposals were entirely based around aesthetic issues such as wind farms and HS2, which he said were part of a “cult of ugly” ruining the natural world. He supports fracking, however, as the process can be “covered by big screens”. Dr Julian Huppert said his post-election priority would be to ensure the Government started publishing all the research it commissions. He said he was proud of the Lib Dem’s record in coalition “but it doesn’t go far enough”. A Lib Dem majority government, he said, would offer 15 years of ring-fenced science funding at 3% above inflation, and double the money for innovation over the next Parliament. He said Conservative led policies on immigration had damaged the intake of students to the UK and that the scrapping of post-study work visas should be overturned to help postgraduate students. “We’ve always said that the cap [on migrants] is silly and won’t work, and it hasn’t. Those ‘go-home vans’ were a good example of daft ideas that don’t make the UK sound welcoming to foreign students,” he said. Scotland’s minister for learning and science Dr Alasdair Allan said the SNP offered “an alternative to the consensus around the need for austerity” and wanted more independence for Scottish decisions about science. He said Scotland’s lack of tuition fees was good for improving access to STEM careers, but that Scotland was still bound by Westminster on how much it had to spend on science. The SNP’s Dr Eilidh Whiteford told the BES debate that the Scottish Parliament had “produced world-leading environmental targets” that had led to an impressive 29.9% reduction in greenhouse gas emissions between 1990 and 2012. An annual ‘health check’ of the world’s plants; an ambitious online portal that is a one stop shop for all plant and fungal information held at the Royal Botanic Gardens, Kew; a new focus on Tropical Important Plant Areas, home to much of the world’s plant diversity; a Masters course aimed at tackling the skills crisis in taxonomy; an annual children’s plant science festival – these are just some of the exciting initiatives revealed in RBG Kew’s new science strategy published on February 24th. The strategy, to be implemented over the next five years, firmly places RBG Kew’s vast collections at the heart of its science and clearly articulates the role that its collections-based research must play in addressing the complex questions and enormous challenges facing humanity: climate change, food and fuel security, disease, poverty and ecological scarcity. Professor John O’Keefe, from University College London, has been awarded (jointly) the Nobel Prize in Physiology/Medicine for 2014. He is recognised for his contribution to understanding the wiring of the brain. He has studied the function of the hippocampus, and, in particular, its role in spatial behaviour and spatial memory. In 1971, he and John Dostrovsky discovered that the major correlate of hippocampal pyramidal cells was the animal’s location (place cells) and suggested that these might form the basis for a spatial mapping system. In 1978, together with Lynn Nadel, he expanded this notion and suggested that in addition to the place cells, the hippocampal formation might contain information about direction and distance. Together with the place cells this will allow the construction of a cognitive map of the environment. A cognitive map is a device for representing the current environment, the animal’s location within it, and the location of desirable objects and threats to be avoided. Its outputs direct the animal’s behaviour on the basis of distances and directions towards desired goals or away from undesirable objects and the locations. Additionally, the cognitive mapping system detects the absence of representations of novel environments and changes in maps of familiar environments and uses these mismatches to trigger and control exploration. His team further elaborated on how the cognitive map theory could be expanded by the inclusion of a linear sense of time and the storage of language narratives in the left hippocampus to explain the episodic memory deficit in patients with hippocampal damage. Subsequent work revealed cells in the hippocampal formation signaling the two types of information necessary to construct maps. In the 1980s, Ranck, Taube, Muller and colleagues discovered head direction cells in the presubiculum. More recently Haftig, Fyhn and May Britt and Edvard Moser (with whom he shares the Nobel Prize) have found grid cells in the entorhinal cortex which could provide the spatial distance metric. Together with Neil Burgess he constructed computational models of the cognitive map and its components, and have used these to generate theoretically-driven predictions which inform our empirical investigations of hippocampal function. This attack on these questions/predictions uses various combinations of behavioural, electrophysiological, pharmacological and genetic approaches. Their primary approach was to record from groups of individual hippocampal neurones during spatial navigation, exploration of novel environments, and foraging for food in familiar environments. Although born in the USA, he has spent almost his entire career at UCL. He has dual citizenship. Immigration is known to enhance the intellectual achievements of the host country. The Nobel Prize for Physics in 2010 was awarded to two Russian immigrants working in Manchester. Anne-Maria is Principal Lecturer in Bioscience and Forensic Biology at London South Bank University. She serves as a wildlife inspector, specialising in wildlife crime investigation within DEFRA’s Animal Health and Veterinary Laboratories. As an academic, she actively encourages young people to embark on scientific careers particularly from traditionally hard to reach groups such as women and those of BAME backgrounds. She regularly participates in science café-style events and was recently instrumental in establishing a ‘science in the pub’ venue in London SE1. In over 30 years as a biologist and supporter of the Association, Anne-Maria has demonstrated the aims and purposes of the Association in both professional and public life and continues to promote the good of the Association, whilst encouraging others to engage with science in all its forms. Dr Brennan has a longstanding involvement with the British Science Association. This started when, as a newly graduated biologist from the University of York, she helped the 1981 Annual Meeting. The experience had considerable impact on her, and led to her commitment to incorporate public understanding/engagement into her future career. She has done this, and continues to do so, both within and outwith the Association. Over the years Dr Brennan has been active in both the Biology and General Sections, having served as Section Recorder of the former and remains involved in the latter. She has also been a Trustee and member of Council and has served on various committees including the General and Audit Committees. When it comes to the Festival programme, she displays considerable powers of persuasion in convincing speakers that the Festival is the place to be rather than the beach or conference hall. She is an ambassador for the Association, seeking to draw people into its sphere of influence, thus forging mutually beneficial links. Dr Brennan’s readiness to reach out to hard to reach groups has been a recurring theme in her career. A founder member of the Durrell Institute of Ecology & Conservation and the Institute of Ecology and Environmental Management, within five years of the York meeting she was building links between science and the public. Dr Brennan was using her research on the environmental impact of golf to advance the understanding of environmental management in the golf industry. She did this through the Nature Conservancy Council’s On Course Conservation initiative and acted as environmental advisor to both the Professional Golfers Association (PGA) and the English Golf Union (EGU) and formulated the EGU’s environmental policy in her book Living Together: Golf & Nature in Partnership. She took the initiative to the United States, bringing together America’s golf and environmental bodies at the Pebble Beach Summit of 1995. Building on her research of the environmental value of recreational areas, she highlighted the ecology of parks and gardens. She was scientific advisor to a number of television series including Channel 4’s Garden Doctors, and Over The Garden Wall, presenting an episode of the latter and writing the Channel 4 book to accompany the series. Throughout her career she has engaged with the media, writing news stories for New Scientist and BBC Wildlife Magazine and wrote the natural history notes for CEEFAX page 262 in the 1980’s. She is also co-author of First Ecology a popular textbook published by Oxford University Press and has contributed to a number of other books.